Beer Nerd Details: 7.2% ABV bottled (22 oz. bomber). 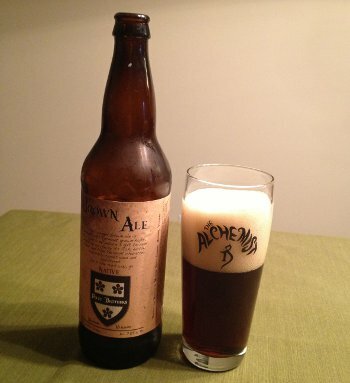 Drank out of an Alchemist pint glass on 8/25/13. It's funny. Your ratings end up relatively high for the same reason I rarely outright dislike a beer. We're good enough at picking beers out that we just don't grab terrible beers. Even random ones end up being at least decent because there's enough resources out there now to avoid awful beers. Yeah, it's pretty easy to get to B+ level in my book, and that's my most frequent rating by far. In truth, a lot are probably in the B or B- realm, but I do genuinely enjoy them so I slot them in at B+. You really have to screw something up to go below a C, and something has to be epicly wrong to score an F.
I like to think that to move up to an A-, it takes more than is implied by the single uptick, but that's my second most frequent rating. I'm definitely more picky about A and probably far too stingy on the A+. And these days, I'm not as slavish about writing up every beer I drink, and who wants to write about mediocre beers? This page contains a single entry by Mark published on August 29, 2013 7:14 PM. Lawson's Finest Liquids Double Sunshine IPA was the previous entry in this blog. Cantillon Saint Lamvinus is the next entry in this blog.